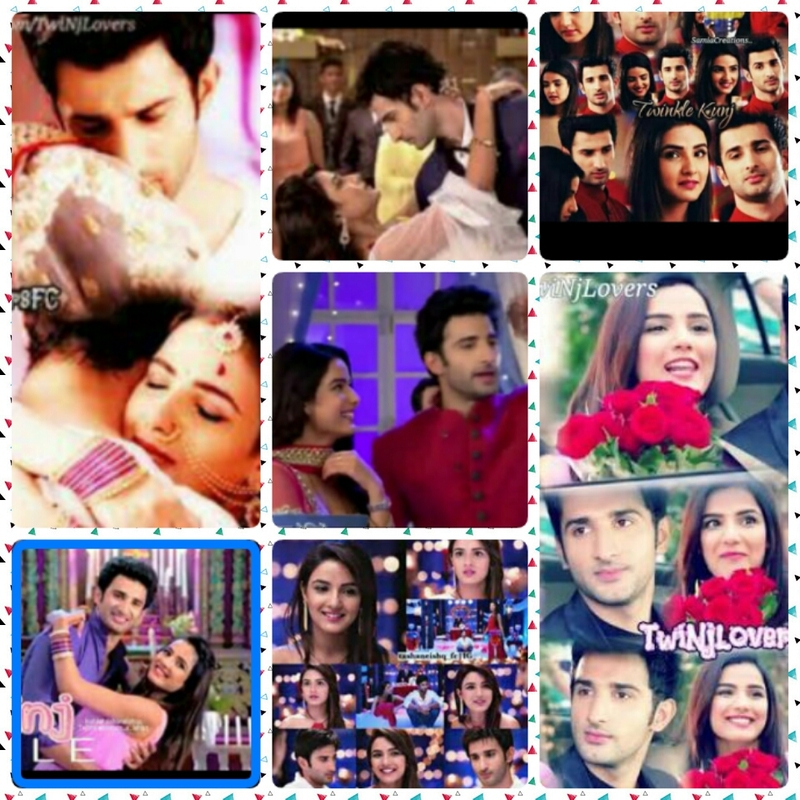 The Episode starts with twinkle blushing and looks at Kunj who joined the youngsters …she too went and sat opposite to him ..
Kunj Abeer Yuvi and Karthik was sitting together while meher twinkle and ansh together amaira didn’t came there as she will directly come here after wedding ..
Where was Leela rt Usha Manohar Ragini Neil bebe and Suhasini were sitting together .. I can’t believe ansh is getting married in less than 5 days Ragini said tearfully while all smiled seeing her excitement ..
Yeah everything is booked we are leaving in midnight Manohar said ..
Yeh all the arrangements are done we have cross checked it too rt said ..they all were happy for ansh and Amaira .. While the youngsters were busy teasing ansh ..
amaira didn’t came today how he will celebrate his rose day now Abeer said while all laughed ..
Yeah really Karthik added ..
Huhuh you all should have brought her any how ansh said making crying face making all of them laugh ..
Waise Abeer bhai how you are celebrating rose day Yuvi asked ..
Ab kya rose day celebrate kare ab to Roz jaisa hi day hai Abeer said teasingly ..
Abeer Meher throws cushion at him ..
Bhai bhabhi please clear your misunderstanding you both have you sort it out na Karthik said ..
Yeah twinkle Kunj if there is anything ? Let me know I’ll try to sort it out but please clear everything first Abeer said ..
Don’t worry guys Kunj said he walked towards twinkle and sat beside her ..
We have already sorted out Kunj said wrapping his arm around her while she smiled ..
Whatttt ?? All said shocked but were happy for twinj ..
Toh tell this to everyone na Abeer said .. But why ? Meher asked .. If we will tell them now only they will say we are again doing this again in pressure we want to stay together and then tell everyone that we are prepared to bare each other for rest of this birth Kunj said while all understands .. So secrets meeting now Haan ? Abeer asked teasingly ..
Yah Kunj said all cheered for them while again ansh joined them .. While passing the curry the spoon fell over twinkle dress .. I am sorry beta Ragini quickly apologized ..
Are aunty no need just tell me the way to washroom I’ll clean it ..twinkle said ..
Ansh will you please take her Ragini asked ..
Han Kunj you take her Abeer added while twinj got up and went to guest room ..
Twinkle how much time you will take Kunj said ..
Kaha ? Kunj asked teasingly ..
Downstairs everyone’s is waiting for us twinkle said .. So they will wait for some more time more Kunj added tucking her hairs behind ..
Waise I am seeing since the time you came when ever you looks in my eyes you starts blushing why so ? Kunj asked smirking ..
No I am not blushing twinkle said .. Lie you are blushing now also Kunj said pecking her right cheek ..while twinkle held him more tighter for support ..
See Kunj said showing her ..
What I can do now when I sees you I went down the memory lane of last night twinkle said ..
Ahaa but you are looking damn pretty today Kunj said teasing her more ..my magic na he added while twinkle hits him.. I never knew you are so flirty twinkle said ..
My cheeks are paining Kunj now no more teasing twinkle said ..
Achaaa okay Kunj added ..
Waise twinkle where is my birthday gift ? Kunj asked ..
You didn’t got ! I left there twinkle added confused ..
Where ? Kunj asked .. But you should have handover it to me only Kunj said .. But I left na twinkle said pouting ..
Huh we were equal Mr sarna don’t forget twinkle said .. Yes we are equal mrs sarna ..but now I want my gift Kunj said ..
What you want ? Twinkle asked ..
What ? Twinkle asked with wide eyes ..
Yeah I can’t stay away from you more now Kunj said .. But how can I kunj ? Twinkle asked ..
if you complete this task I’ll promise to gift you something Kunj said .. Complete your challenge then I’ll give he said .. pulling her closer while they were giggling in each other embrace fighting and challenging each other ..when they heard Usha voice ..and left each other and stood as if nothing happened …she entered the room ..
Twinkle ? Usha said ..
Ji mummy ji twinkle asked playing with her dupatta ..
You have cleaned your dress ? Usha asked ..
Yeah twinkle said …we were coming downstairs only she added quickly ..
Yeah come Usha said and left while Kunj passed her a kiss she left making faces while Kunj chuckled .. Please my devars help me na give me any idea twinkle said .. I never knew my bhai is so romantic Karthik said while Yuvi and he giggled teasing twinkle ..
You both are helping me or not ? Twinkle said ..
Ofcourse we will help you bhabhi they said and excused bebe and Usha ..
Maa ask bhabhi to come back home na Yuvi said ..
Why ? Usha asked ..
Amaira was crying last night that she had no one to share her feelings and bhabhi is only of her age in our house me bhai and Karthik are to boys ..Yuvi said ..
Yeah maa bhabhi will be a great help to aamu Karthik said ..they called amaira and made her talk to them too ..
Yeah maa I want someone too I can’t share with you all or with my brother’s I can ask bhabhi anything amaira said fakely crying ..
Yeah I think they all are right and even Ragini and Neil are having doubt about twinj bebe said .. Okay I’ll talk to Twinkle Usha said ..going while bebe joined elders again Yuvi and Karthik hifi .. Drama queen superb work Yuvi said ..
Oye I am your elder sister amaira said ..
Abey chup bye Karthik added the trio siblings giggled and ended the call ..
Twinklee was sitting with Meher and Ishaan they were teasing him while Abeer and Kunj n ansh were having some important discussion ..
Twinkle puttar I want to talk to you Usha said ..
Yeah mummy ji twinkle replied ..
Wo puttar I want you to come back home see na amaira and others want you to be there if you don’t have any problem please come Usha said . Mummy ji you don’t have to request me I’ll come home with you all don’t worry twinkle said ..Usha left while Yuvi and Karthik coughed and stood beside twinkle ..
I’ll help you both in same way as you both did twinkle said while the trio smiled .. Soon all were done they were ready to leave while Ragini Neil and ansh bid them bye ..
Karthik Yuvi Manohar and Usha were leaving in one car where as Kunj and bebe in other ..
Kunj was sitting waiting for bebe when she came and sat beside him on passenger seat ..
Shall we leave ? Kunj asked ..
Yeah wait someone is coming bebe said ..
Twinkle quickly sat in back seat while Kunj looked at her through mirror surprised.. ..
How you did it ? Kunj asked suprised ..
That’s twinkle Taneja magic she said ..
Yeah twinkle sarna she said again ..
Nah twinkle Kunj sarna sound’s more better Kunj added I love you soooooo much he said and hugged her tightly ..
Now where is my gift ? Twinkle asked .. Yes I’ll give you Kunj said ..he heard someone coughing..they turned to find amaira Yuvi and Karthik ..
See Yuvi Kittu bhai is so fast amaira said ..
Yeah he sorted everything so early Yuvi added ..
Yo man after all bhabhi Jaisi pretty wife ho toh …karthik said teasingly ..
Oye biwi hai meri Kunj said ..
Yeah bhabhi hamari the rest trio added while they laughed ..
Well thanks to you three twinkle said and hugged them while Kunj smiled ..
Why are you standing there come join us amaira added while Kunj too joined them in group hug …they all went inside and sat ..
Aamu ? You invited everyone na ? Karthik asked ..
Yeah I did amaira said .. I mean your best friend also na ? Karthik said ..while twinkle signed Kunj ..Yuvi too giggled .. But why are you asking Kittu ? Kunj asked ? ..
Nahi bhai just we didn’t invited many of them in your wedding na that’s why Karthik said ..
Yeah yeah true Yuvi said hifi ing with twinkle .. I know about whom you are asking amiara said .. joining them ..
Huh go and see your ansh is calling Karthik said and ran from there while the rest laughs Usha Manohar sees them and smiled .. They all retired to their rooms for packing after sometime twinkle went down to prepare dinner while Usha and bebe were packing off amaira luggage which was to be send to Khanna mansion and also to take for the wedding ..Kunj sees them busy and quickly escaped from the hall and enters kitchen to find twinkle preparing dinner with some of the workers …he coughed to gain her attention ..
Twinkle looked at him and asked through her eyes what ???? ..
Come outside Kunj said while twinkle nodded in no ..
She rubs her feet against his while he looked at her with wide eyes and chewed mirchi he started coughing while twinkle quickly took her foot back ..
What happen ? Kunj puttar bebe asked worried .. Nothing bebe Kunj said and passes twinkle I’ll see you later glare while she smirked .. Soon they finished off their dinner and again went back on working mode ..
Kunj went to his room followed by twinkle who was smirking as soon as they enter kunj locks the door and pinned twinkle towards ..
What you did downstairs Haan ? Kunj said ..
What ? Twinkle asked innocently ..
Acha you don’t know Kunj said and pulled her closer while she smirked ..
No I don’t know twinkle sat while Kunj bends down nuzzling in her neck biting her twinkle screamed ..he sucked the bite to soothe the pain ..
You are so bad twinkle said ..
What I did ? Kunj asked making same expression as of her ..
Huhuh acha Kunj I want to talk to you twinkle said with some seriousness in her voice ..while Kunj was confused ..
Yeah say Kunj said ..
Why are you asking ? Kunj replied .. I have saw since our wedding you don’t talks to them much like aamu Karthik and Yuvi …twinkle said ..
Yeah that’s true Kunj said sadly and narrated her everything about his childhood Papa sent me to boarding and never cared to see me once even he and maa didn’t used to come to meet me always dadu and bebe only used to come so I detached myself away from them ..Kunj said ..
see like you said your siblings were not fine so may be they wanted you to be healthy only like Papa told you Kunj and even if we become parents we will always want our child to become successful hai na twinkle said ..
Yeah I never realised but now I think I shouldn’t think about it Kunj said ..
Hmm yeah you should twinkle added ..
Waise twinkle I have also saw you not in good terms with your parents too Kunj said ..
Hmm twinkle told him I was angry with Papa for leaving me here but I was more angry when he brought me back from college without my will from that time my bonding with them became worse twinkle said ..
Ohhhh Kunj said ..but you also think about it twinkle any dad would do that if he finds his daughter stressed because of any guy even I when I’ll become even I be a protective father Kunj said ..
Yeah we have to sort this too our life is total mess twinkle said and laughed ..while Kunj too .. Suddenly they both went in thoughts and looked at each other ..
What you said sometime before twinklee said ..
I’ll be a protective father twinkle told his words ..
Yeah I’ll Kunj said proudly ..even you said if we become parents too Kunj added her words while they smiled ..
and now planning for kids Kunj said ..
better late than never twinkle said while they laughed again ..
Acha how many you want ? Twinkle asked ..
Hmm I let me count Kunj said and started counting on his finger while twinkle looked on wide eyes ..
22 ..23 ..24 ..Kunj was counting ..
Kunjjjj twinkle said and hit him with pillow while he laughed seeing her ..
Acha now tie tie phis Haan Kunj said snatching the pillow ..
Huhuh I never know you are like this huh twinkle said giggling .. I was joking okay I just want one kid not much disturbance Kunj said .. Soon it was time for them to leave the guys Kunj Karthik and Yuvi kept the luggage outside while twinkle along with Usha and bebe were checking the rest thing while amaira was sitting with Manohar as everyone restricted her from doing any work ..
Everything is set let’s go Kunj said entering inside ..
Yeah and Abeer bhai and family will meet us at airport directly Yuvi said .. Soon they all came out of sarna mansion and sat in cars Kunj too joined them and they left for airport they went inside and after all security checking they went in aircraft …all the while Kunj hand was protectively around twinkle waist ..their fight took off after few mins….all rested ..
After few hours they reached Vizag where the wedding was scheduled as Ragini was south indian so ansh wants to get married in south India style and Amaira wanted a beach wedding …they all left for the beach resort where the preparations were already done .. Soon they reached ..and was grandly welcomed they were given their room keys and all went to rest ..
Twinj goes to their room while twinkle gets freshen up she smiled looking outside view while Kunj sees her ..
Let’s go downstairs he insisted while twinkle agreed and they went towards the beach ..
Why you brought me here Kunj let’s sleep na we have a lots of work today twinkle said ..
don’t you want your gift ..Kunj said ..
Yeah it just slipped out of my mind twinkle said ..
Open it he said forwarding twinkle while she smiled ..and opened to find wedding ring for couples ..
You always wanted to wear something like this right Kunj said ..
Yeah when did you brought it ? Twinkle asked with a glitter in her eyes ..
but when I was searching for my document I found it Kunj said ..
Ohhhh twinklee said so this is my first wedding gift Haan she asked ..
Yeah Kunj said ..may I ? He asked while twinkle happily forwarded her hand ..he took out a ring and made her wear it and kissed her hand while she smiled and made him wear his ring too ..
Now this moment is perfect she said while both smiled joining their hands .. Happy promise day mrs sarna Kunj said pecking her forehead ..I promise to stay with you always no matter what …Kunj said ..
And I promise to not to leave you in any circumstances twinkle said pecking his nose while the duo smiled and have a beautiful warm hug .. Soon they retorted back to their room and slept in each other embrace .. Thanks to all who commented on the last .. Thanks you Anusha di for your comments ..